RoboSavvy Forum • View topic - The New Robotis CM-900 board is now out!!! The cool thing is that it is free and it is open hardware and software!!! Now, I find THIS ironic! Was just saying how the Maple Mini (STM32) is working great as an off-board PWM controller on another thread. I would guess that these (STM32-based devices) will continue to be quite popular for integration / peripherals for some time to come. The Specs for the CM-9.04 New Open Source Servo Control Board from Robotis have just been released. 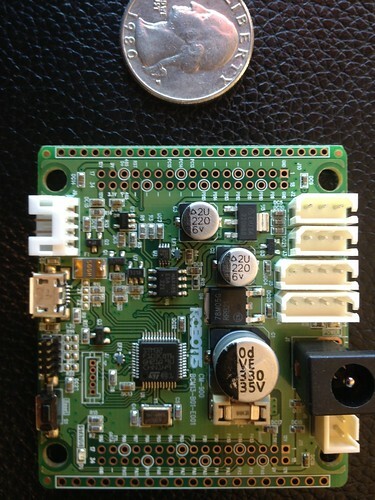 The new Robotis open source servo control board will be out soon. It is the replacement for the CM-900. The improvements are in price from 20 to 10 dollars USD, smaller size and doubling of the amount of flash memory. Hah! Now it's using the exact same STM32 as on the Maple!!! I think they're going the right way with the smaller size. I can say we've been trying to get a hold of these new boards for a while now but I believe the first batch is only being dispatched in early August by Robotis. Afaik in addition to the improvements in size and spec Robotis I believe Robotis has also fixed some minor hardware bugs and side effects in the original board so this should all be good news. I just wish we could have a repository of "sample code" for different application scenarios from Robotis to make development easier. (for example I just got an inquiry today of a customer looking to emulate the CM-700's capability of acting as a bus interface and memory mapping the IO ports using the Dynamixel protocol).